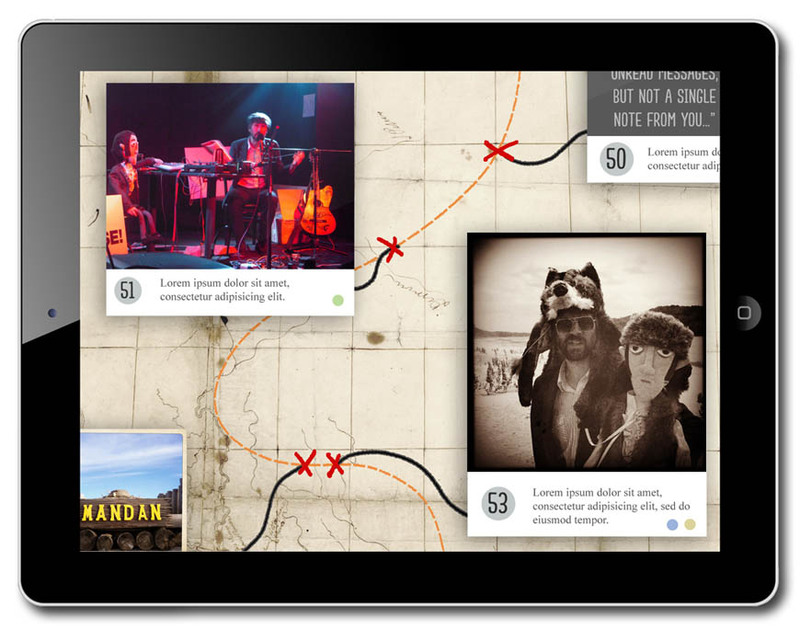 An odyssey into the American Wilderness with an Explorer, a Musician, and an iPad. There’s something romantic about a hero in pursuit of an unattainable goal, chasing a myth or a dream – Percival Fawcett and El Dorado, Juan Ponce de León and the Fountain of Youth, Ed Wood and his cinematic masterpiece. Characters that charge ahead with an unwavering belief in their goal, no matter how unachievable, their passion taking them to places ordinary mortals wouldn’t dream of reaching. This is the world of American Interior and explorer, John Evans. Evans was a man whose firm belief in the existence of a Welsh speaking tribe of Native Americans, the Mandans, drove him over 3000 miles from his home in North Wales, deep into the frontiers of unexplored America. In passing he became a Spanish Spy, contracted Malaria, and created a map that formed a major contribution to defining the borders of the United States. 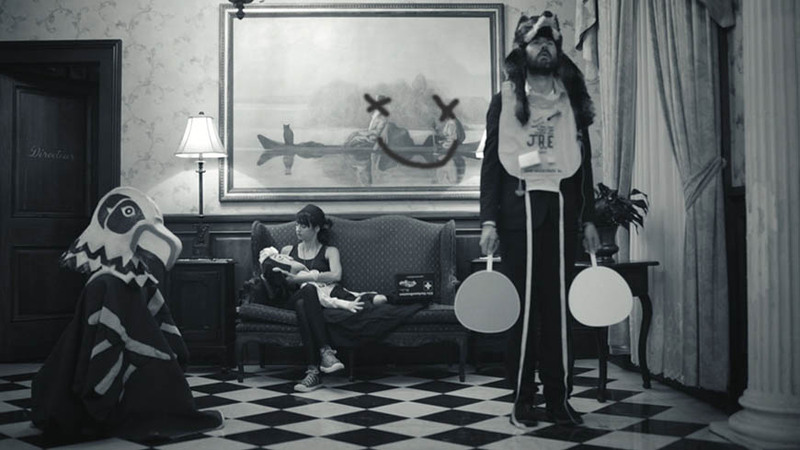 There’s an echo of John Evans determination in Gruff Rhys. In 2012, two hundred and twenty years after John Evans started his journey, Gruff Rhys began his ‘Investigative Concert Tour’ tracing the route of Evans’s journey. His objective, to shine a light on a character few people had heard of and to turn that into a project that spans a film, book, album and app, reveals an intriguing and ultimately tragic story across two countries and two time periods. By late 2013 the book, album and film were nearing completion, and Storythings had been working with Penguin to find a way to bring American Interior’s story to an app. The main challenge was to find an approach that told the story in a way that made it unique from the other platforms (and therefore worth doing), played to the strengths of the format, and work with the behaviours of those who would pick the story up on their phones and tablets. The basis of the app’s approach already lay in track 3, side 1 of the album in a song called 100 Unread Messages, in which Gruff imagines checking his gradually accumulating messages waiting for some sign of John Evans. It was about this point that Matt spoke to me about the project, initially reading an early draft of the books initial chapters. Even in this unfinished form you could see the bones of a sprawling, witty epic threaded through with coincidences & outlandish events (to the point where I had to Google John Evans to check it wasn’t shaggy dog story). Shortly after I came on board in a role utilising my interchangeable Director, Producer & Design heads. The first task in translating the story was to go through and break it down into 100 beats that would take a slice of the journey and turn it into an easily digestible ‘postcards’. This vast editorial job fell to Hugh, Gruff, and the films producer Catryn Ramasut working through hours of edits, out takes, photographs and recordings. What this process afforded though was an opportunity to reassess hours of footage and take material that was interesting or relevant but didn’t fit it into the film’s narrative, and find a place for it to live in the app’s own unique version of the story. A early (i.e. highly inaccurate) story map to work out the areas where the 3 Acts of American Interior take place. While this process started myself and the developers (Adrian Bigland on iOS and Thomas Hopper on Android) worked on prototyping and pipelines, creating initially a vast and intimidating Google spreadsheet which was then simplified into a friendlier humanised form. This, when exported would form all the content for every message, it’s coordinates on a map, all the text, and links to every piece of content. Therefore anyone with access could go in and edit, fix, or amend any element of the apps content ensuring there was no bottlenecking around creating and amending the content. Each message was assigned a specific content type- images, text, audio, video or animated gif. The Gif has been revitalised in the last few years as a format, especially for showing tiny funny or meaningful moments. In this case we looked for small sequences in the film, a flashing police light or a train ride, and turned them into visually poetic, never ending looping films. We also thought about circulation of these messages. Once they have the app how can they share and send them on? Matt had recently been looking into the use and rise of cards as a way of sharing and encapsulating stories. Since this was such a neat conceptual fit the developers dove in and investigated the use of Twitter cards and deep linking. This work was to ensure we could make every message sharable from within the app, and supply every shared message with a link that would open up the app and take you directly to that message (if you have it installed) or the app store if not. However there needed to be a way to connect these messages, a metaphor that doesn’t replicate a or imitate the form of a book, and delivers the story at a pace and manner shaped by us but ultimately controlled by the viewer. Also, since the story is being told on large and small handheld devices, ensuring the experience played to the strengths of the platform and the attention patterns of those who use them. One thing I am wary off when thinking of new ways ways to present information, (in this case how a book can work on digital devices), is to let the cleverness of the interface distract from the substance of the content. Key for me was that whatever the method was, it served the story, not drowned it out. Early discussions played with ideas about delivery and how these messages would be found or sent to the reader. They could be delivered over a set number of days, they could be unlocked by being sent a link, or it could be a case of unlocking later acts. However instead we decided the best experience would be to let the viewer decide the pace at which they trace John and Gruffs footsteps, gradually unlocking and absorbing each piece of the story as they go. An early rough mock up of the map and messages (we quickly found it would never work at this scale as the maps would be huge and destroy your iPad). This approach also unlocked the answer of how to present these messages. 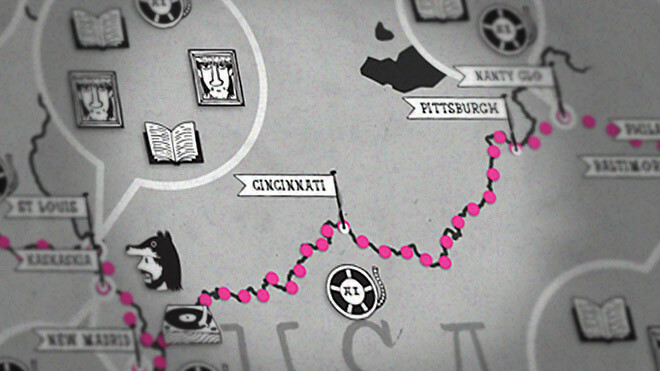 As Gruff followed in the footsteps of John Evans, the viewer would follow the journey in the same fashion tracing the same route, opening 100 messages left for them along the way. Each of the messages would be placed along a map (across 3 countries and two time periods) in a fashion that felt playful and uncomplicated. It’s worth noting there’s a lo-fi, hand made aesthetic across the project that also fed into the way we approached designing the app; from the handmade John Evans puppet Gruff takes on his travels, to the slide show presentation and the vinyl records he uses as a backing band used in his concerts. The final map in the app with it’s custom made illustrations by Pete Fowler. To keep this continuity through all the platforms, Pete Fowler, designer of the John Evans puppet, renowned illustrator and long term collaborator of Gruff Rhys, helped to create new assets for the app, from animations to icons, all lovingly hand drawn. The colour palettes also take their lead from the film by being primarily monotone with isolated moments of colour. Sound is often the most overlooked aspect of design, but it is integral to making the whole experience sing – getting it wrong can destroy all your fine well thought out design decisions. To this end and in keeping with the hand crafted lo-fi design ethos, all the audio sound effects in the app, every button click, swipes sound and ping were recorded by Gruff himself, mostly without using any instruments, just vocal sounds and noises. But of course it’s not all about looks. Behind the maps and messages was a highly skilful technical team working in synch with each other (one in Brighton, the other in Bonn) to create a technical pipeline between the content and the different platforms, both of which were being developed simultaneously. To double up on the dual platform development we also doubled up on languages with each piece of text and content being available in both Welsh and English. Working on the different issues of content and mechanical needs a way of working was evolved that meant testing and making changes on multiple platforms in two languages was as smooth as possible. John Evans’s quest to find his native Welsh spoken in the wilderness of America ended in 1796. Spoilers ahead, so skip this sentence if you wish to find out for yourself…He finds the Mandam Tribe, but no, unfortunately they don’t speak fluent Welsh. Two years later he died of from Malaria in a hotel room in New Orleans, believing he’d failed in his quest. Evans may not have reached his unattainable goal, but his legacy came from a bi-product of his mission. The detailed maps created on his journey would help the Lewis and Clark expedition of 1804, and later become a factor in defining the borders of the United States. No image of John Evans exists, nor is there any journal to reveal his thoughts, but these four objects, an album, film, book & app, piece together his story through small fragments left throughout the landscape of Wales and America and tell it in there own unique way. You can follow Gruff Rhys and John Evans by walking in their steps, starting your journey here. American Interior: 100 Unread Messages was nominated for a FutureBook Innovation Award and featured in the Guardian’s top 10 apps of 2014. This post was originally written for Storythings website.